As scientists predict that soon there will be more plastic in the oceans than there are fish, a group of artists have been commissioned to explore the problem. 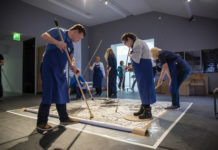 Their work forms part of the “Changing Tides” creative programme, which is partially funded by The Arts Council and curated for the Three Festivals Tall Ships Regatta taking place in Liverpool and Wirral on May 25-28. Artist Lulu Quinn has created two, giant 26ft (8m) bottles, made entirely from recycled plastic bottles, which at night becomes a beacon, illuminated by a glow from within. The bottles will appear in Salthouse Dock, in Liverpool, and in New Brighton, Wirral. They are created from plastic bottles which have been collected with support from organisations across Merseyside, including Veolia working in partnership with MRWA who collected hundreds at their Gilmoss recycling site. The bottles will feature messages from local schoolchildren inspired by the artist’s very timely focus on plastic pollution. At the close of the festival, as the Tall Ships sail away, Liverpool’s bottle will embark on its own journey as the installation crosses the Bay of Biscay to Bordeaux aboard the Tall Ship La Malouine. 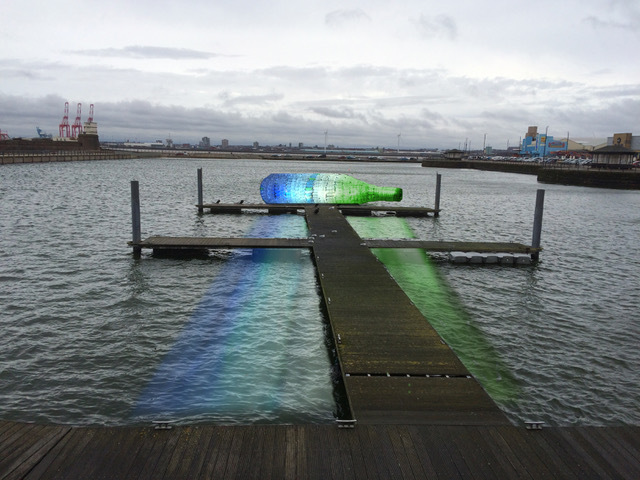 Wirral’s bottle will remain in place on Marine Lake as a stunning focal point on the waterfront, as well as a reminder of its environmental message. Lulu Quinn’s previous work in Liverpool includes a sculptural piece celebrating pioneering city politician Eleanor Rathbone, which stands in Greenbank Park. 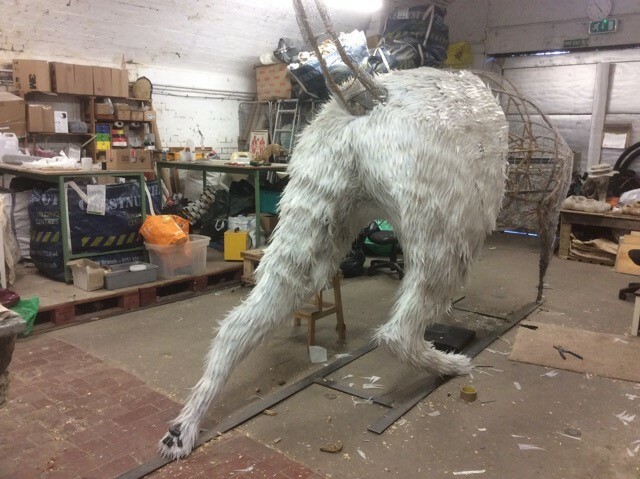 Local sculptor Faith Bebbington is also creating a 15ft long cat made entirely out of milk bottles, which will go on display at the Albert Dock chasing her famous “Super Rat”, which hit the headlines after it appeared on a rooftop in Liverpool’s Baltic Triangle in 2016. The tabby Cat, which is inspired by legendary feline seafarers like Ms Chibley, who circumnavigated the globe as chief rodent control officer on the tall ship Picton Castle, has been created from around 2,000 reclaimed milk containers, collected by staff in Liverpool’s Cunard Building as well as Crown St Day Centre. They are cut up by hand by the artist, then stitched on to chicken wire – and at 15ft long, it’s Bebbington’s biggest creation yet. As well as the artwork, the festival team are also working with the Keep Britain Tidy, Great Plastic Pick Up campaign, which aims to turn the tide on plastic. 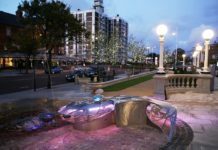 Keep Britain Tidy Chief Executive Allison Ogden-Newton said: “700,000 plastic bottles are littered in England every day and many of those will find their way into our streams and rivers and, ultimately, our oceans. Assistant Mayor and Cabinet Member for culture, tourism and events, Councillor Wendy Simon, said: “The problem of plastic waste in our seas and waterways has never been more topical and it was very important to us to address the issue as part of the Three Festivals Tall Ships Regatta. “As well as the thought-provoking artworks we have commissioned, we are also working to reduce plastic consumption across the whole festival. A spectacular fleet of tall ships from across the world will return to Liverpool for the fifth time for the Three Festivals Tall Ships Regatta, a free event which takes place between 25 and 28 May 2018. An exciting programme of activities is planned across Liverpool and Wirral to celebrate the arrival of the ships. 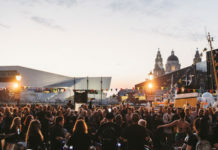 Liverpool’s events include international and local art works, installations, music, dance and theatrical performances commissioned by Culture Liverpool. 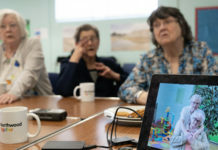 Wirral is hosting a range of maritime-themed events including street theatre, music performances, creative and circus workshops and a spectacular 3D projection onto Birkenhead Town Hall, which have been organised by Wirral Council. Wine-lovers are also expected to flock to the waterfront as the world-renowned Bordeaux Wine Festival make its UK debut. And there will also be a focus on getting young people aged under 26 from Merseyside involved in the race. The Sail Trainee project, will see 50 local youngsters, aged from 16, join the crew of a tall ship on a 5-day voyage from Liverpool to Dublin. 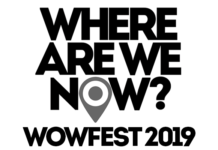 The event sponsors includes the Mayor of Liverpool, Liverpool City Region, Arts Council England, Mayoral 100 Club, Fazenda, Liverpool BID Company, Heart North West, Arriva, Merseyrail, Sail on Board and University of Liverpool. 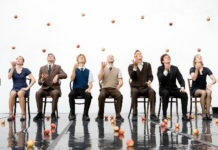 For more information visit www.tallshipsliverpool.co.uk.